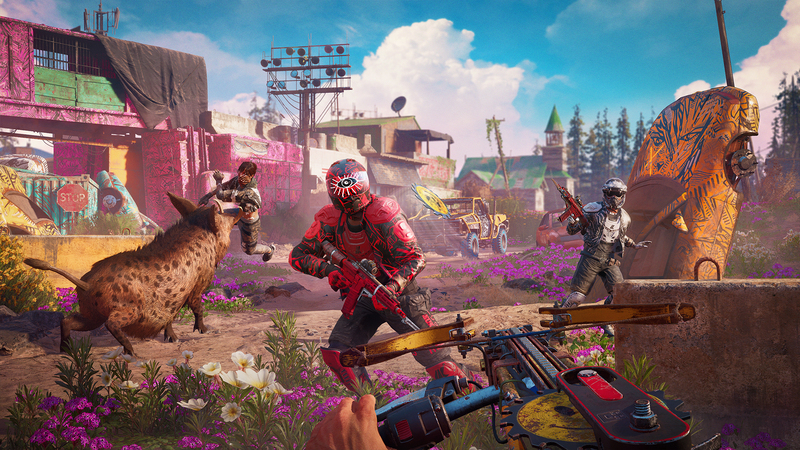 Far Cry New Dawn is a standalone sequel to Far Cry 5 that takes place after a nuclear apocalypse. Ubisoft teased the announcement earlier this week, but has now made a full reveal at The Game Awards. New Dawn is scheduled to launch on February 15 across current platforms, including PC. While the game takes place 17 years after a “global nuclear catastrophe,” this is isn’t the desolate wasteland you’d expect from most takes on the post-apocalypse. 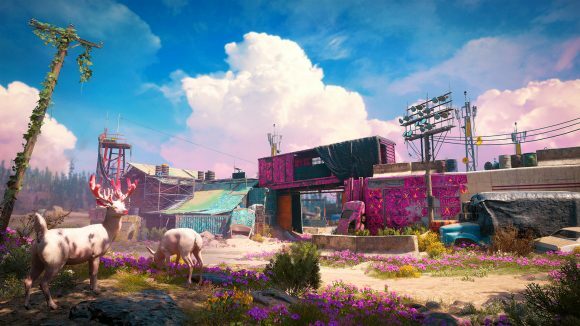 The setting is still Far Cry 5’s Hope County, Montana, but the worldwide ruin has brought a bright dash of colour to the setting with loads of flowers and some very pink-obsessed survivors. Your villains this time around are the Highwaymen, led by the Twins, Mickey and Lou – they appear to be the the two people who made their first appearance on today’s leaked box art. 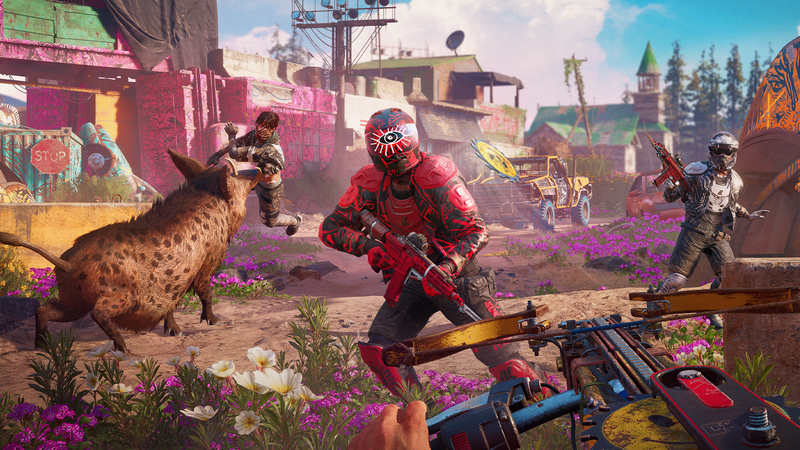 As an unnamed member of another survivor group, you’ll be building an arsenal and making alliances in order to stake your claim on a beautiful and deadly frontier. You’ll have a central home base called Prosperity where you can craft weapons and vehicles, or train your Guns and Fangs for Hire – which Ubisoft notes will include “new and familiar faces.” You’ll upgrade your base over the course of the game to improve your gear, and this is also where you’ll set out on Expeditions. Expeditions are a new gameplay element that will send you out to unique locations throughout the US, including unnamed wetland and canyon locales. There, you’ll be tasked with grabbing some important materials and getting out. The co-operative ‘friend for hire’ option is also still here, so you’ll still be able to play with buddies. 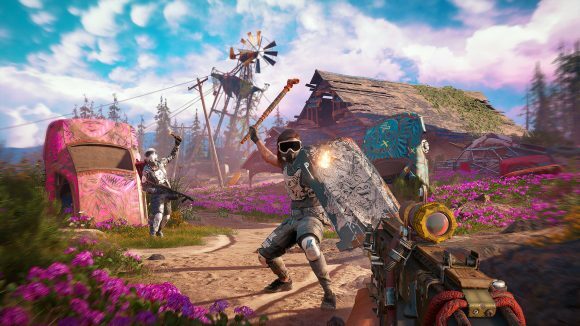 If you’re interested in the specifics of who’s been working on New Dawn, this is principally a Ubisoft Montreal production, supported by studios in Shanghai, Kiev, and Bucharest. Keep current on every upcoming PC game – after The Game Awards, you’re going to need a list to help keep track of them all. Luckily, we’re here to help, and we’ll be bringing you all the updates from the show over the course of the evening.